Whitley Bay's Liam Brooks in action battling the strong wind. Whitley Bay overcame an early setback to progress into the second round of the FA Vase with a comprehensive victory in difficult conditions on Humberside. They will now travel to Thornaby in the next round, their third away tie of the competition this season. Callum Anderson, who had missed the previous five games with a groin injury, passed a fitness test and took his place in the centre of defence, while Josh Nearney, Matty Cornish and Kyle Patton also returned to the starting 11. The strong and blustery conditions were a factor in the opening goal when Westella & Willerby took a third minute lead. The Hull side forced a right wing corner and when the ball was played into the goalmouth it was caught in the wind and there was a scramble, which resulted in Gary Flounders forcing it over the line. 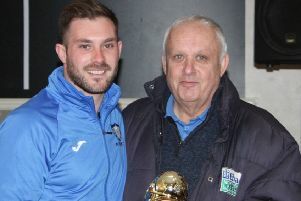 Whitley finally got their game going and their pressure saw them deservedly draw level in the 14th minute when Alex Kempster’s cross was slotted home at the near post by Scott Jasper. Two goals inside a minute put Bay in the driving seat. Callum Anderson played the ball down the right to Josh Nearney, who raced away and outpaced the Westella defence before drilling home a low shot, then Kempster fired a 15-yard effort past a static keeper. In the 29th minute Peter Glen-Ravenhill’s free kick from fully 30 yards out on the left completely deceived Taylor and flew beyond his grasp into the bottom corner to make it 4-1, delighting the large Bay contingent. In the second half, Kempster was tripped as he cut into the box, and Tom Potter comfortably beat Taylor from the penalty spot. Teenager Kieran Brannen, who made his debut from the bench in midweek, came on for the final ten minutes for his first taste of Vase football. Whitley Bay: Lister, Nearney, Walker, Glen-Ravenhill, Wilkinson, Anderson, Potter, Cornish (Robertson 70), Jasper (Brooks 70), Kempster, K Patton (Brannen 80). Subs not used: Hall, Summers. Whitley Bay had no midweek fixture, allowing them time to prepare for the visit of Newton Aycliffe to Hillheads on Saturday.